Wandering through the permanent Asian art exhibit at the Minneapolis Institute of Arts, I came across a fully intact reception hall. I was a little disappointed there was no one there to greet me. It did not stop me from stepping into the exhibit. 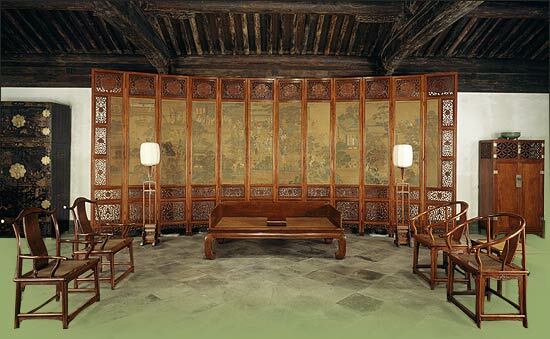 Known in Chinese as a “ting tang” the Wu Family Reception Hall is a classic 17th Century Ceremonial Hall. In China it would have been located in the walled compound, a free-standing building used for special events like religious rituals, weddings and coming of age ceremonies. Mostly, it would have been used to entertain and guests would have been impressed by the diagonal tiles on the floor, the intricately carved beams that made up the ceiling and the 8-person Jacuzzi in the corner. GUEST 1: What did Wu say? GUEST 2: I can’t read lips. GUEST 1: You think he is talking about me? GUEST 2: Why would he be talking about you? GUEST 1: We must have done something wrong. If we were any farther away, we’d be in the courtyard. GUEST 2: You should be happy we got an invite. GUEST 1: I am happy. It’s just… These bean bags should be filled with beans instead of rocks. GUEST 2: Quit whining and drink your tea. GUEST 1: What do you think of it? GUEST 2: It’s pretty bad. GUEST 1: It tastes like tree bark. GUEST 2: It was cold by the time they got around to us. GUEST 1: And we’ll never see the food tray. GUEST 2: You are probably right. GUEST 1: Man, I hate sitting on the ground. I feel like a toddler. GUEST 2: You need to stop complaining. GUEST 1: I’m complaining because I’m hungry. GUEST 2: Just be quiet. I’ll make noodles when we get home. GUEST 1: ………………….. Seriously, you think Wu is talking about me? GUEST 2: If you want to sit closer next time, don’t give a rock you found on the way here as a birthday gift. GUEST 1: It was a pretty nice rock. GUEST 2: It’s still a rock. GUEST 1: ……………………………. This tea is going right through me. Can you help me out of this beanbag chair? GUEST 2: No one can see us. Just roll off the bag and out the door. GUEST 1: Good idea. I’ll see you later in the Jacuzzi.